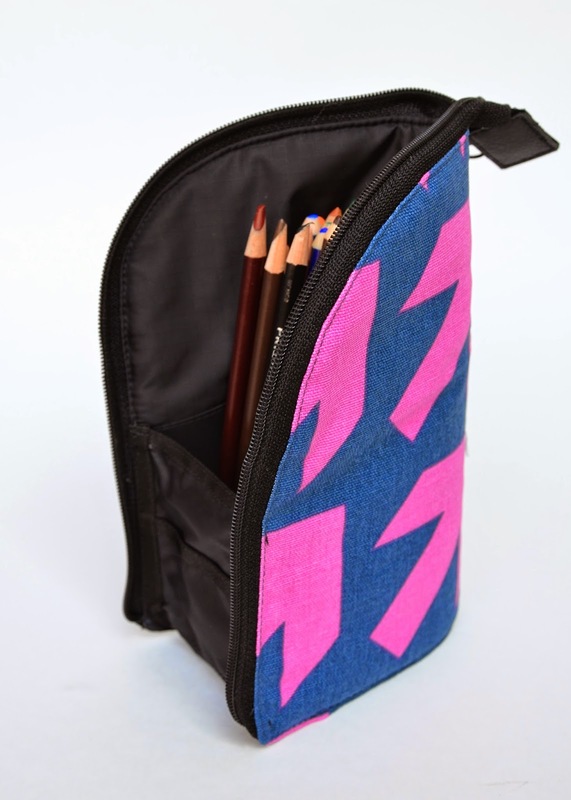 I made more marker pouches this past fortnight. First, a peek into our handmade past. This is Jenna's old marker receptacle. It was well-loved and much-used, but it was never any good, to be honest. Very hard to keep markers from falling out in transit, and spreads over too much space when open to access those markers. 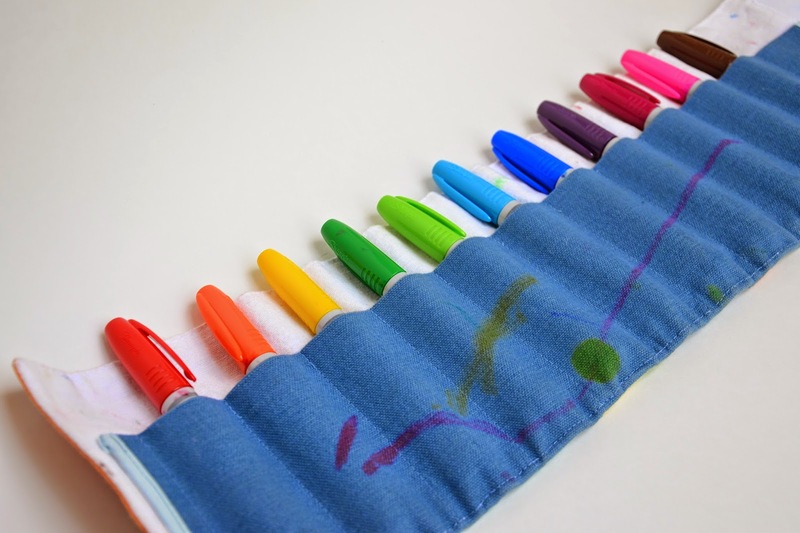 I know that this is practically craft blasphemy, given how utterly adored these pencil/crayon/marker/knitting-needle/crochet-hook/paintbrush/cosmetic implement rolls are in the DIY world, and I apologize in advance if I am offending any Devotees Of The Roll, but they don't work for me. Now, just like everyone else on that particular handmade bandwagon, I've made Rolls, and had my girls use them but . . . do you know what they almost always pick to use instead, given the choice? Yes, those quart-size cheap sliding-zipper bags from the supermarket. I will not be shown up by a plastic bag! The children WILL have a handmade marker receptacle! So last year, I made the prototype. Remember that? 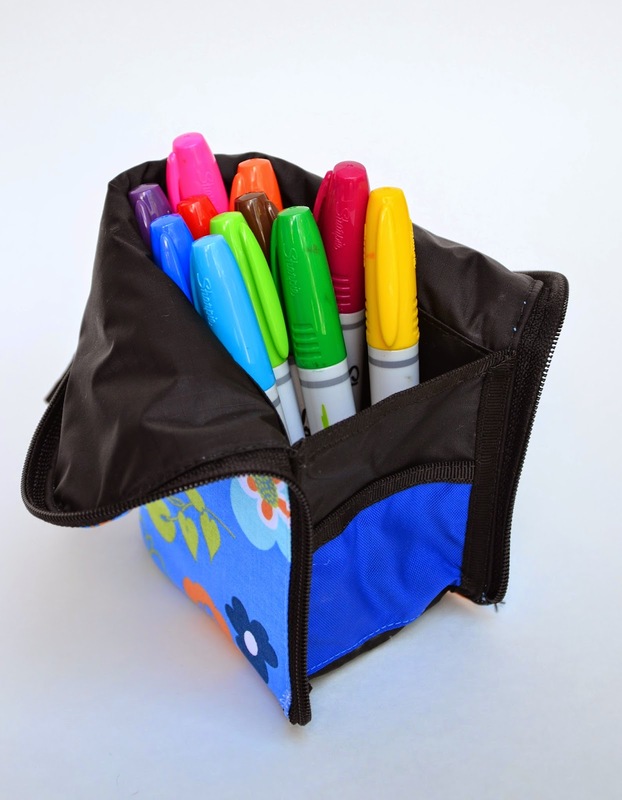 Just to remind everyone, I did not invent this amazing concept of the fold-down marker cup pouch thingy. I saw it on pinterest first. 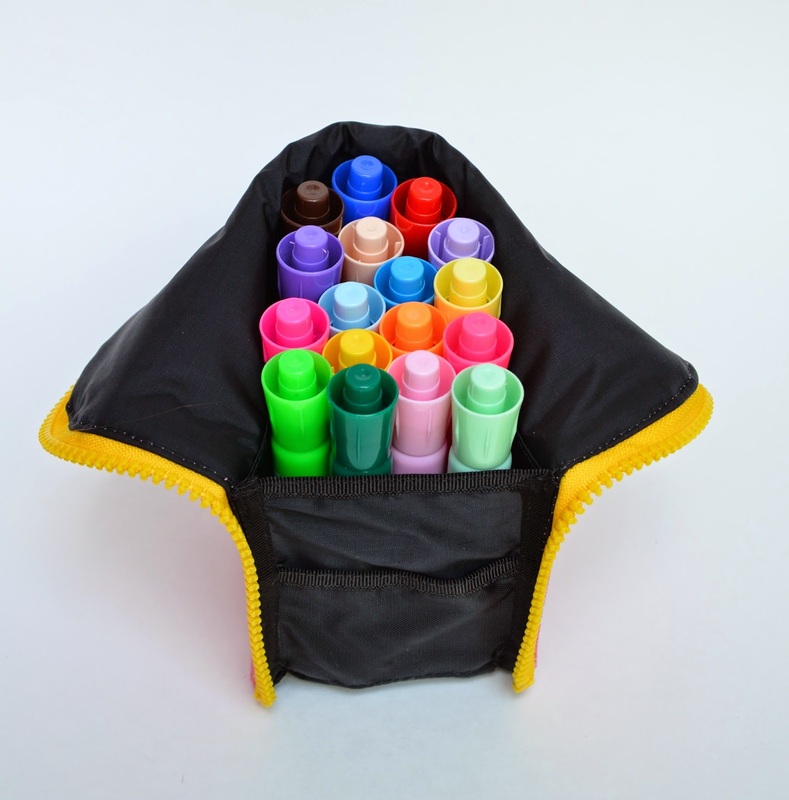 I simply designed a bigger, fatter version to contain the vast quantities of my children's favorite markers. which, to this day, we still call "Jenna markers", in honor of that first set that spearheaded her marker devotion. We put in the whole box of 48 and there was still plenty of room. Back in October when I made the first marker pouch, I didn't think I'd make more. That prototype was slightly fiddly, if I remember. But summer is here, with all its promises of road trips and children lounging around the house, drawing and making art. And that lone pouch has been shared three ways for so long (sometimes with disagreements) that I thought I really should make the girls one each. Which meant mass-producing. Which I like. And which, because of all that repetitive assembling, is the best way to iron out the kinks in a fiddly construction sequence. So I took the girls down to the sewing room, showed them the home-dec stack and let them pick their fabrics. Then I decided that three pouches was wimpy mass-producing, and cut out three more. And finally got to work. Then I remembered that people asked if I might consider a tutorial, and went and found the camera and took some in-progress shots. 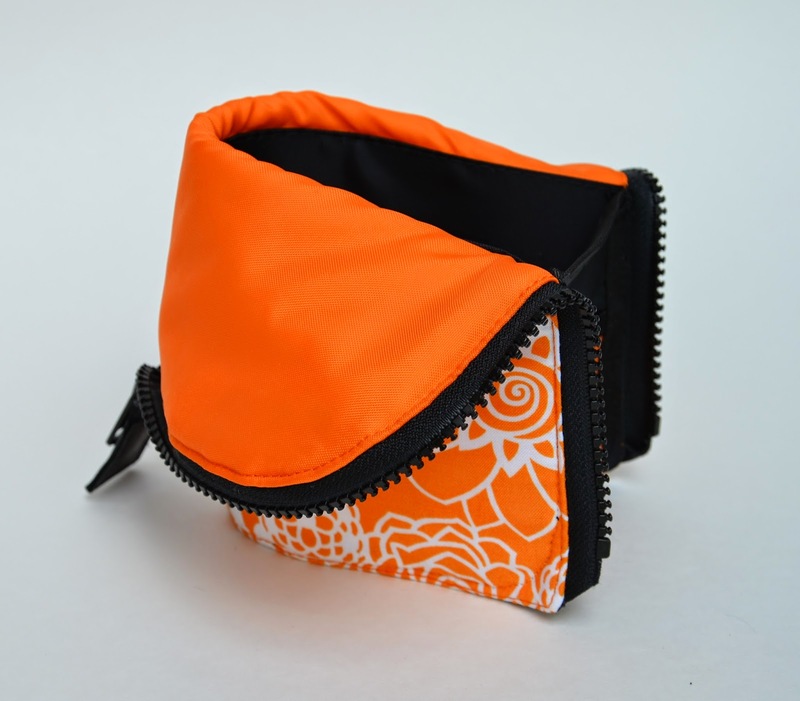 I took photos of the innards of this one because of all that high-visibility color-blocking. 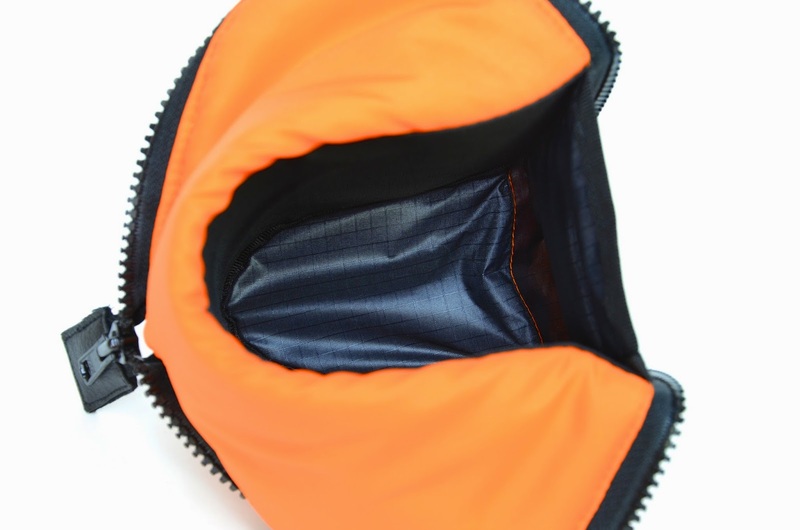 Notice the lining is ripstop nylon that is orange on top and black below. Here it is, folded down. The orange portion is soft, for folding. The black portion is stiff, to support the shape of the cup that holds the markers. The front wall of the cup is soft ripstop nylon again. 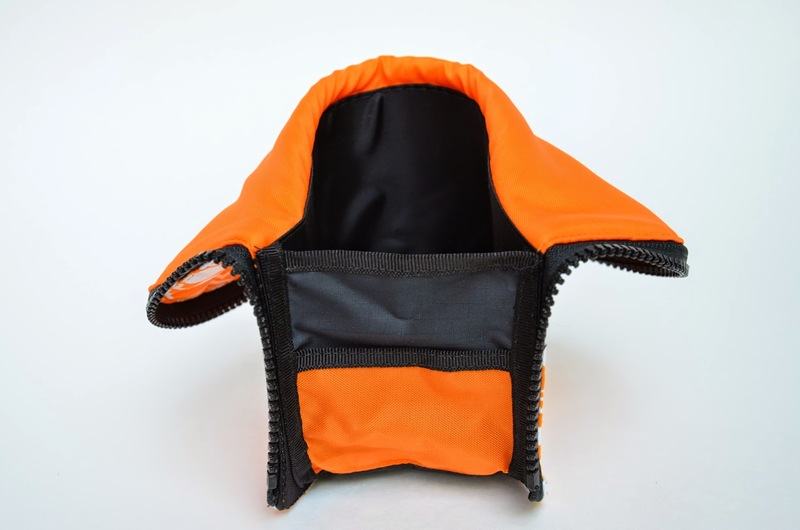 I reinforced it with a short pocket (orange rectangle) just to give it structure and design. Totally not mandatory. This is the inside of the cup to show the base, which is bound around its edges first and then attached to rest of the pouch (will be clear later). Now, I really don't care much about the designer fabric and whatnot, but I do care that when I make a bag of any kind, there are no exposed seam allowances on the inside. 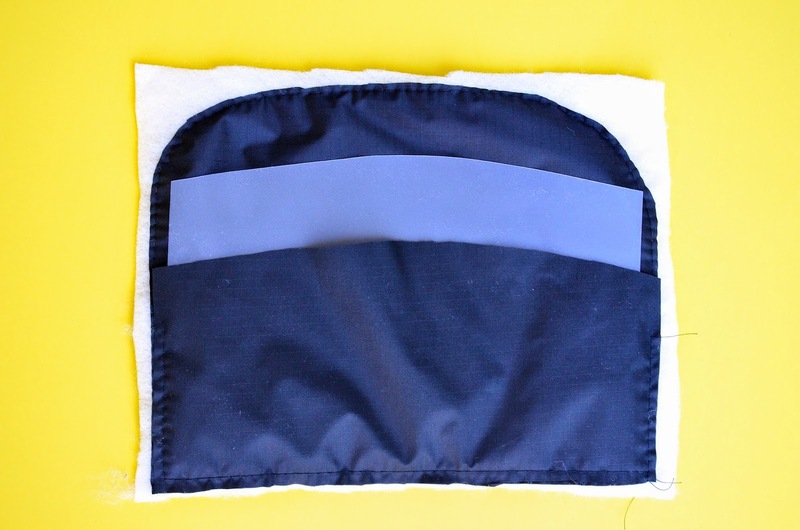 I don't use the serger when I make bags - only when I make clothes. It's very crude otherwise. 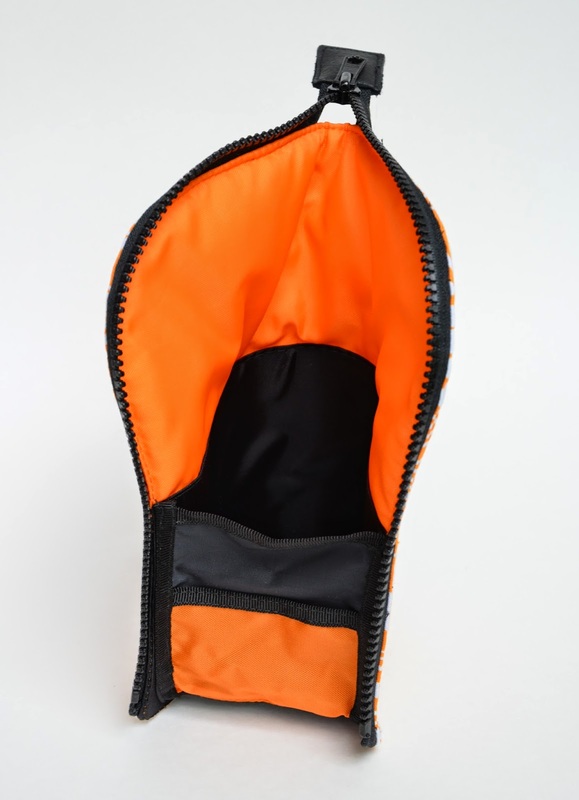 That said, I am sure that there are countless other sequences in which to make this pouch, but I experimented to find a way that hid all the exposed edges and SA. You don't have to do be like me, if you can tolerate exposed SA (serged or otherwise). Step 1 - Make the reinforced lining. Cut template plastic (buy from any quilting or fabric shop) into the shape shown below, without SA. Cut another piece of lining fabric to match the template plastic piece, with SA. 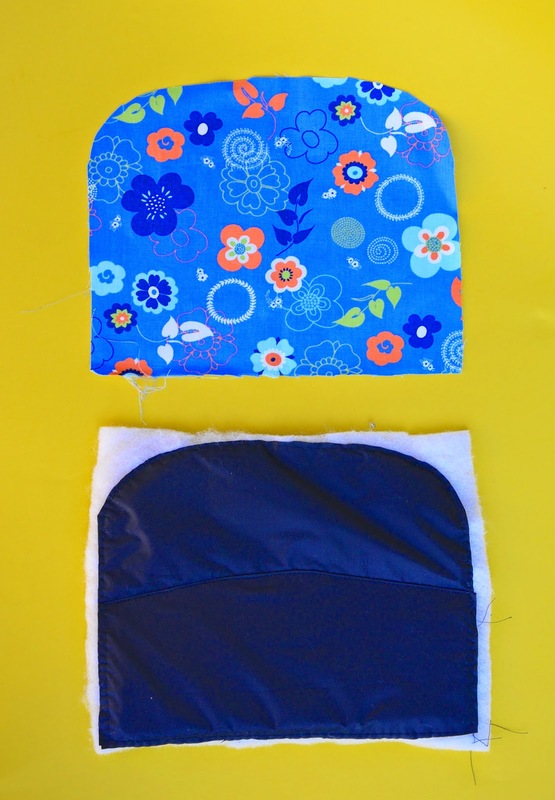 fold down that top edge of the pocket and tuck it behind the top edge of the template plastic. 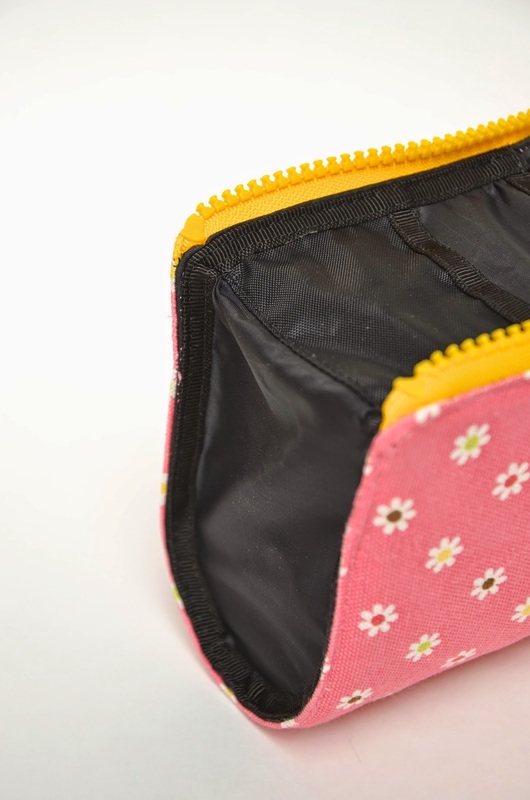 Edge-stitch to close the pocket, completely enclosing the template plastic. I sewed through the template plastic as well. It won't be the first time you might do it in this project. Just remember to change your needle when you're ready for your next project, especially if it's a chiffon skirt or something important. This is the finished lining. 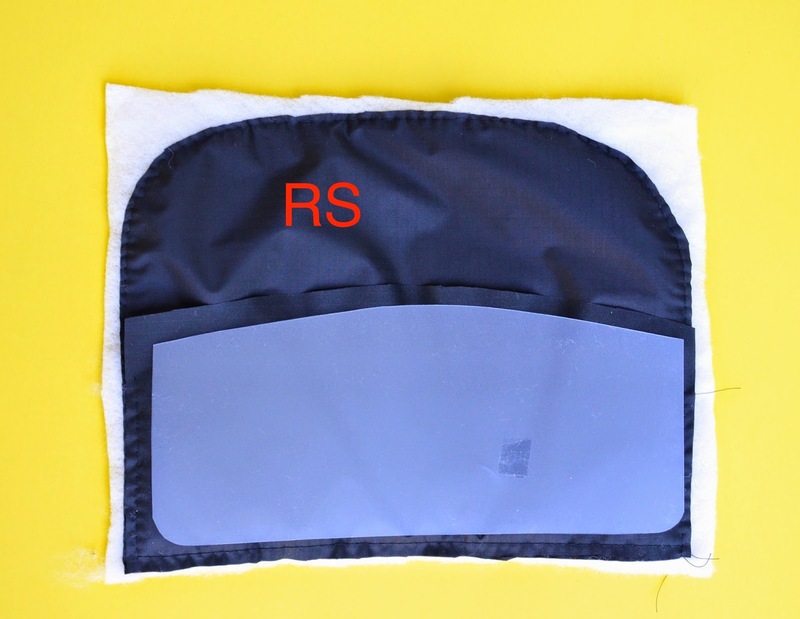 The side that has the pocket is the RS. The side that has the batting is the WS. Step 2 - Choose the nice fancy outer fabric. Please choose home-dec weight or canvas or something of that robustness. If you insist on quilting cotton, please reinforce it with an identical piece of canvas. NOT sew-in interfacing, because it will crumple with all that unzipping-and-folding-down-to-access-the-markers. And especially NOT fusible interfacing (unless you fuse it to the batting) because it doubly will crumple with all that unzipping-and-folding-down-to-access-the-markers. 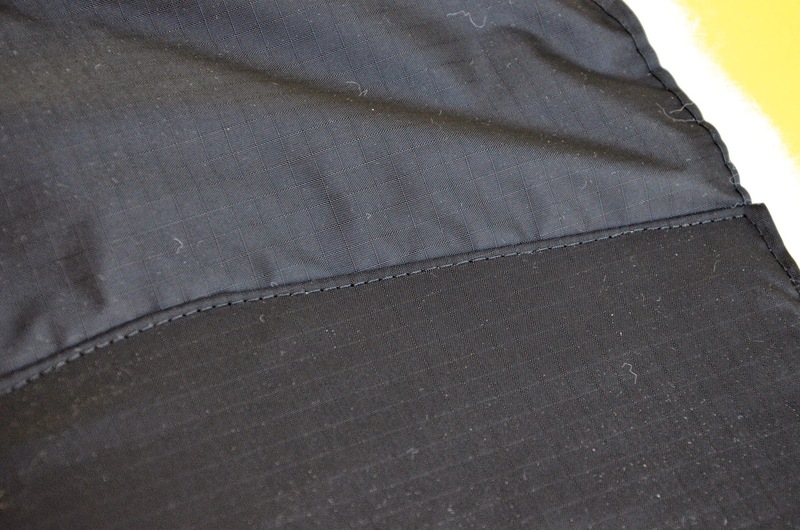 Cut outer fabric to same size as lining, with SA. You can also go ahead and trim the surplus batting now. 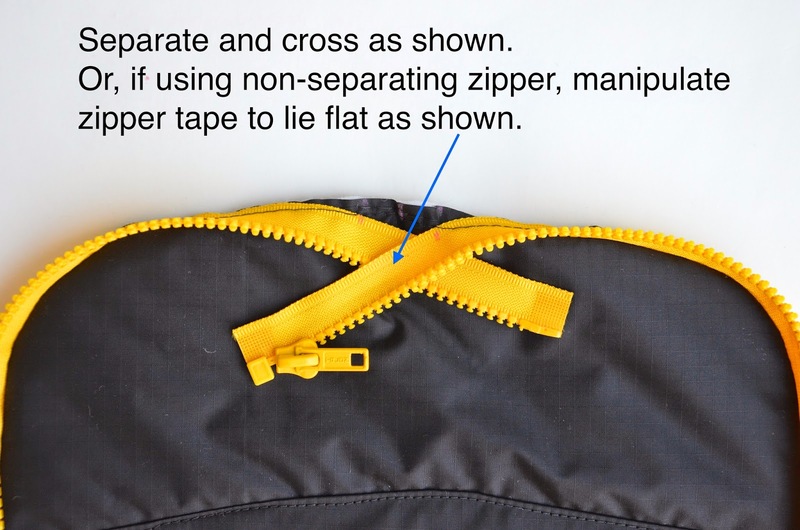 Zip up the pouch to check that the zipper is correctly installed. By "correctly", I mean that when zipped up, the batting side should face out, as shown. This is the surface that will be covered by the fancy outer fabric. 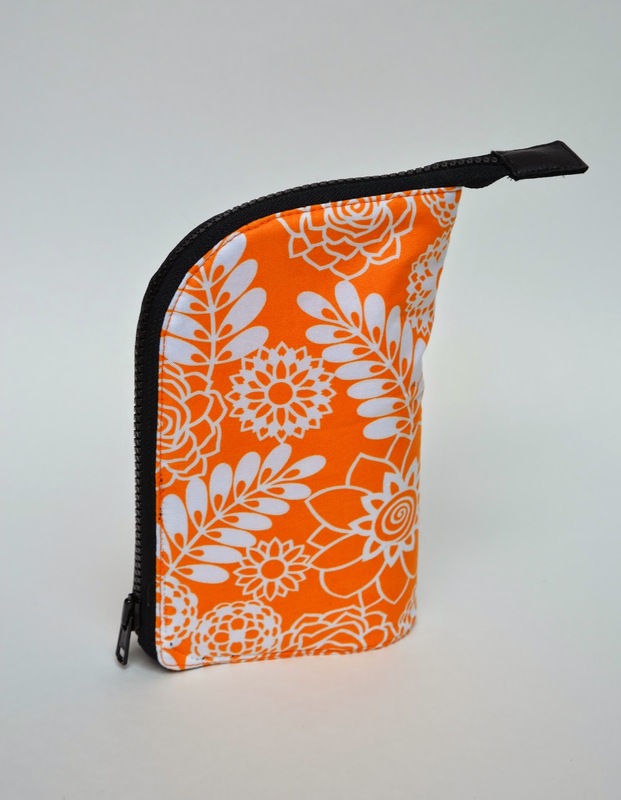 You want the lining fabric to be inside the pouch. 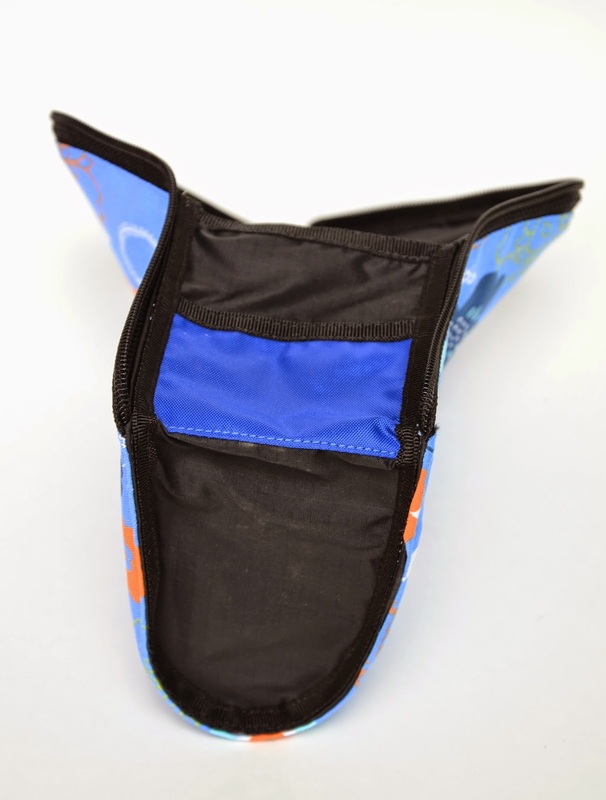 Also check that the tail end of the zipper freely extends out of the pouch and towards the back. In other words, the pouch should look just like the finished version, except it now has just the batting instead of the actual outer fabric. Step 4 - Add the outer fabric. 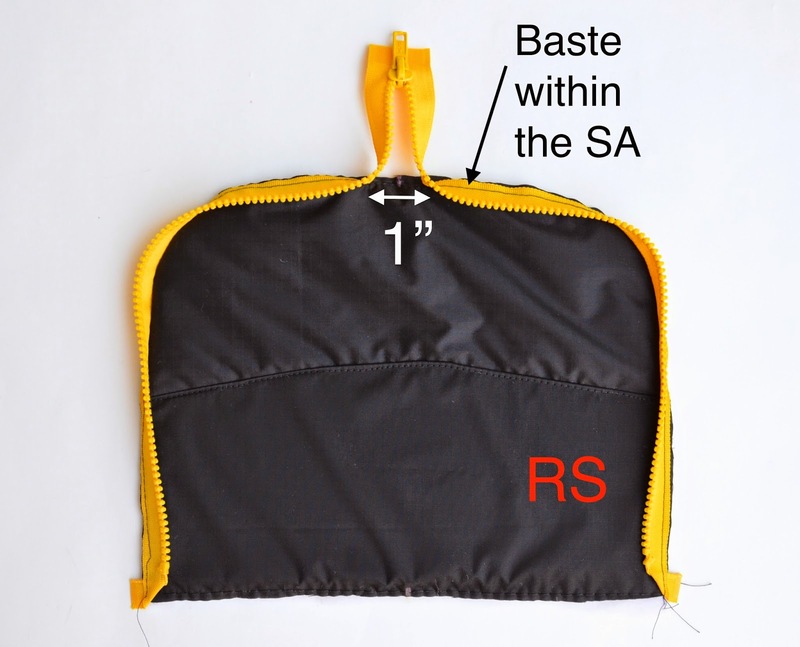 Turn the whole thing RS out, clip/notch/grade/press whatever you need to (yes, you can press ripstop nylon on the appropriate iron setting), tuck the SA of that big opening in, and edge-stitch all around the entire pouch to reinforce and flatten the seam, closing the big hole in the process. This is made entirely out of lining fabric which, in this case, is again ripstop nylon. Cut it in this tongue shape. Bind the entire perimeter. 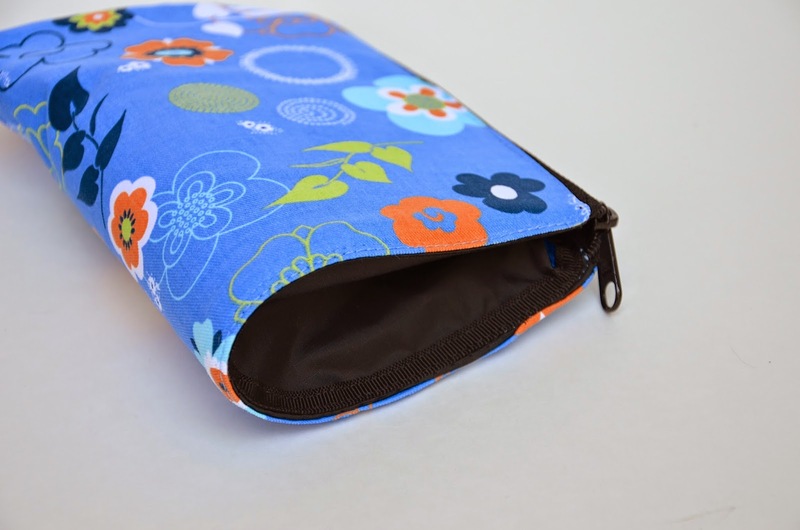 I used the thick grosgrain trim I use for my wallets. You can use bias tape or fully line the entire base/wall so it's a double-layered shape with all the SA tucked inside. Step 6 - Attach base/wall to pouch. 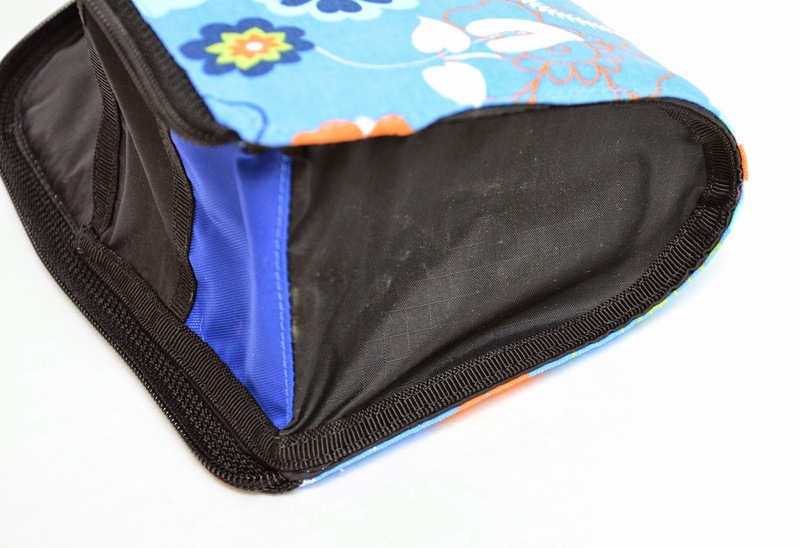 Sew with the base/wall on top and the pouch below, under your presser foot, not the other way around. In other words, the spool thread goes on the base/wall and the bobbin thread goes on the outside of the pouch. If you're leery of ugly stitches, use invisible thread in the bobbin. Step 7 - Finish the tail of the zipper. Self-explanatory: use whatever method and material you are used to, to finish that tail. I used a folded vinyl sandwich because it was fast and easy. And here are the three that are going to new owners as gifts. Good news: I finally got my act together and uploaded the templates here. I'd suggest using the revised instructions in that post, too, which include practical tips. These are amazing! 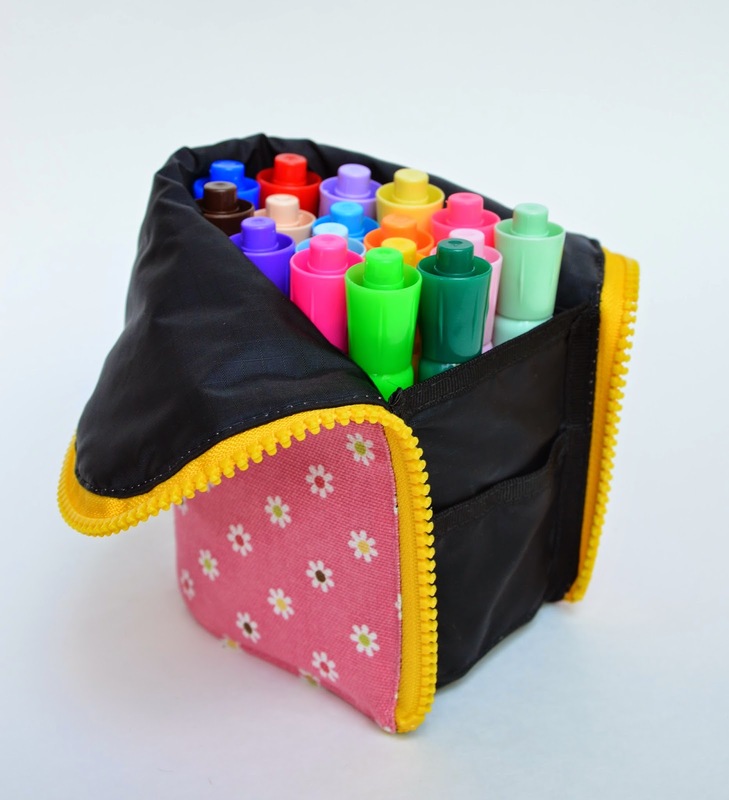 I need to make a few of these for our backpack. We take coloring supplies everywhere to entertain our three-year-old. She LOVES to draw and color. I had the rolls on my list of things to make but this looks so much better for us! Thank you for sharing. I will be pinning it! I have been intending to make one of these for a long time. This tutorial will hopefully provide the impetus to finally make one. Thank you soooo much!!!! I really really wanted to sew one of these, but had no idea how to. You are the best! You always come up with the most productive and useful of patterns, and or products for your children. I wait for your posts, and love your tutorials. There is so much of info for me on your blog, that perhaps you should consider compiling them it into a book ! Thank YOU!!! Now I just have to find ripstop nylon and buy it, find a babysitter and sew! Just a last question: do you think faux leather would work as outer fabric (instead of canvas)? Chiara: you can find ripstop nylon in many colors in JoAnn. Or just use quilting cotton, since it's the lining. And yes, you should be able to use anything for the outer fabric as long as it isn't too thick or too soft. Remember that there'd be a many-layered (including batting) seam allowance around the zipper, that you'd have to edge-stitch around, so if your faux leather is thin (more like fabric than real leather), it'd work. Oh, yes, quilting cotton is a good option, but maybe ripstop nylon is more durable. Anyhow, I'll go with what I find: I am from the homeland of Nutella, no JoAnn store here! These are great. I'm tempted to try making a few, when I've cleared my current stack of projects. 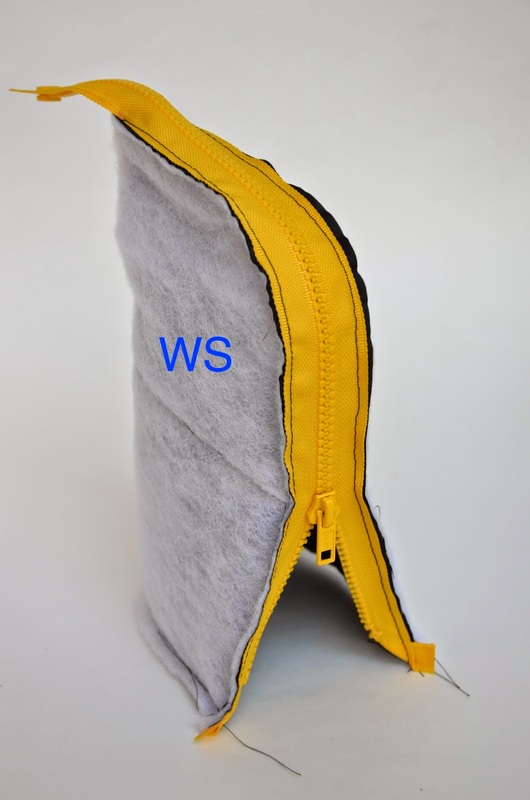 Quick question - when you sew the base/wall to the body of the pouch, do you just edge stitch it? 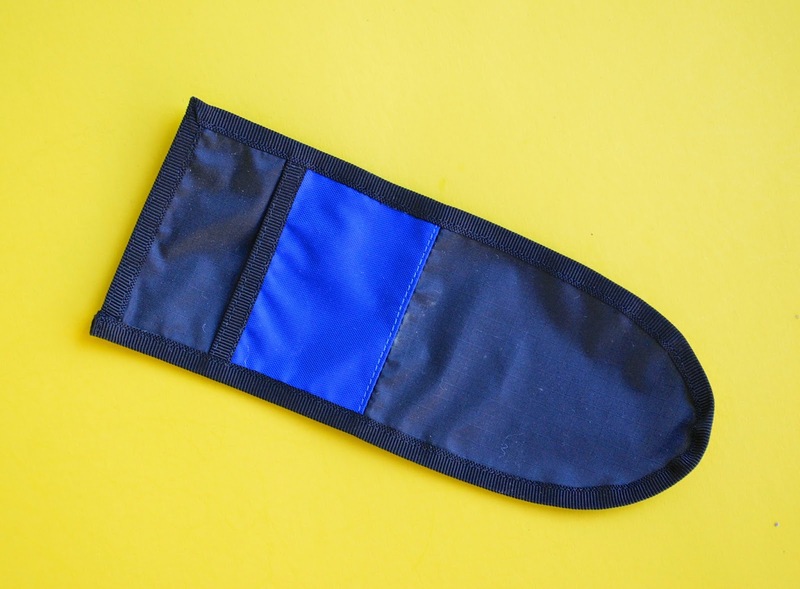 I'm assuming you do an edge stitch, and that it should match up fairly well with the edge stitching already done of the main body of the pouch. Yes, Katie, I just edge-stitch it. Great pattern ! 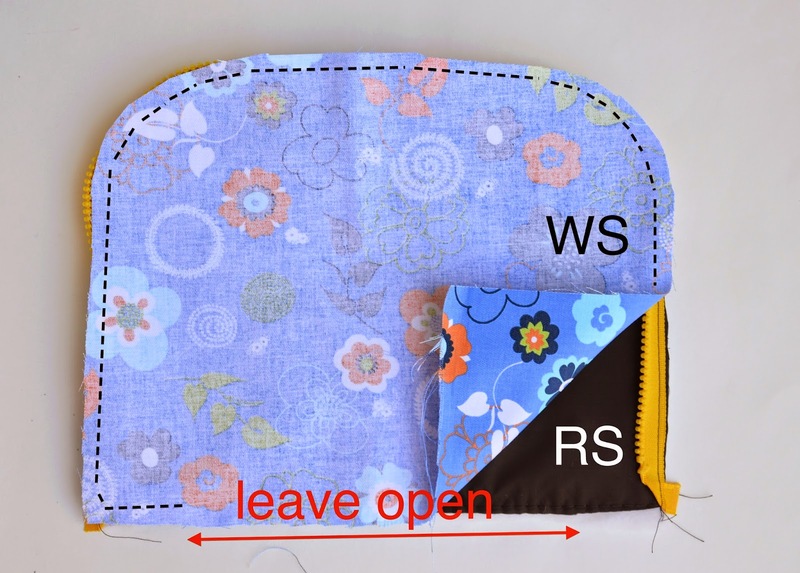 I was wondering if you can also sew it WS to WS and just bind the SA from the outside ? Do you think it would be doable and more simple with one less step ? Claudia: My method is just one possible method of many others. I'm sure there are other ways to make this pouch. Also, by any chance, would you be able to share your templates? These look like a good size, and it would be great to have your tried-and-tested templates to work with. I would buy at least two of these off you in a heartbeat. Kara: I was thinking of putting some in the shop but got distracted by Kate's upcoming birthday party prep. I might still do it if I had some spare time after. thanks for taking the time to take pictures! My girls would love these, it's going on my list of things to make :). Thank you for posting. I ended up buying these for christmas gifts for nieces/nephews as time got away from me. I'm with you - I never got the 'roll ' concept. My kids did fine with Ziploc bags. 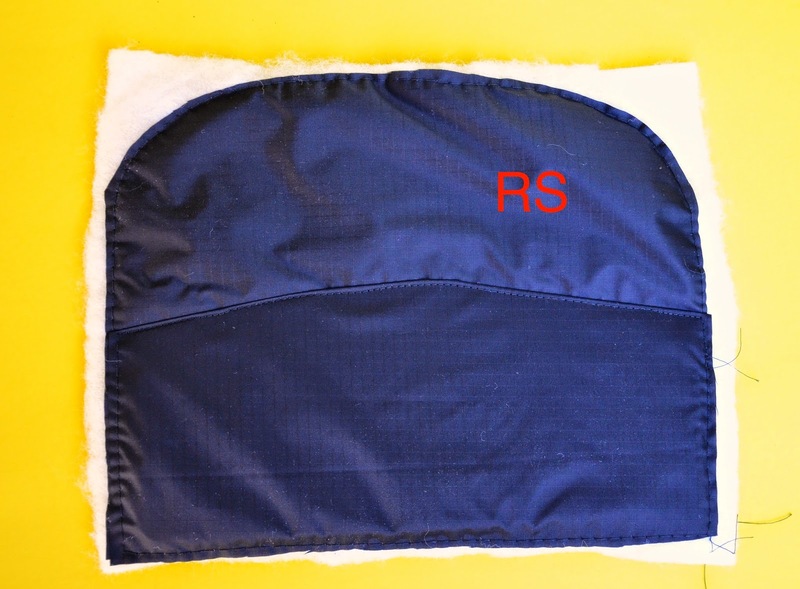 And i need a trip to rose city textiles for the grosgrain trim plus some pretty ripstop. I was hoping you would post a tutorial. This is so clever. Thanks for the tutorial! Wowee, thanks so much for sharing this! You're awesome! 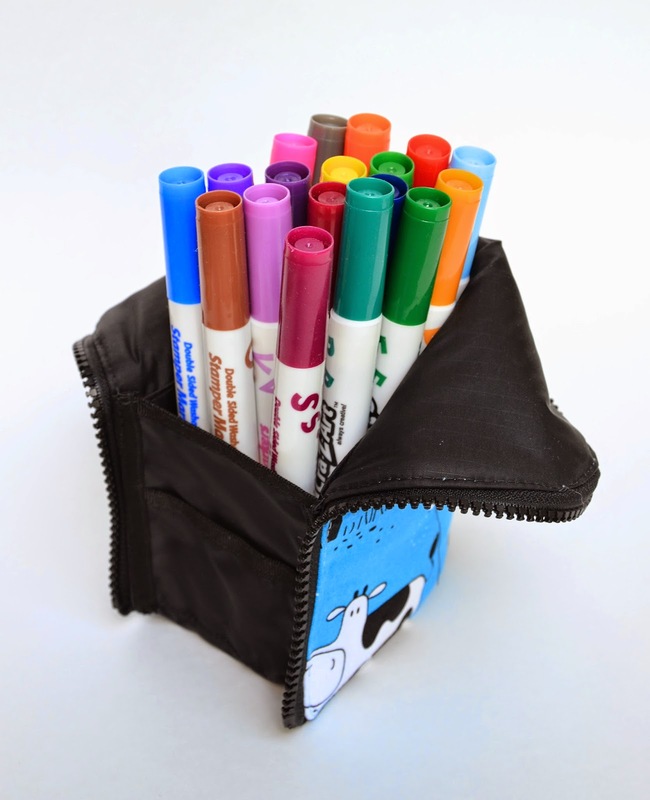 When the markers are very fat and plentiful, do you just zip until it covers the markers? I'm assuming that when you zip all the way down, there has to be some give in the fabric/contents. Love it! 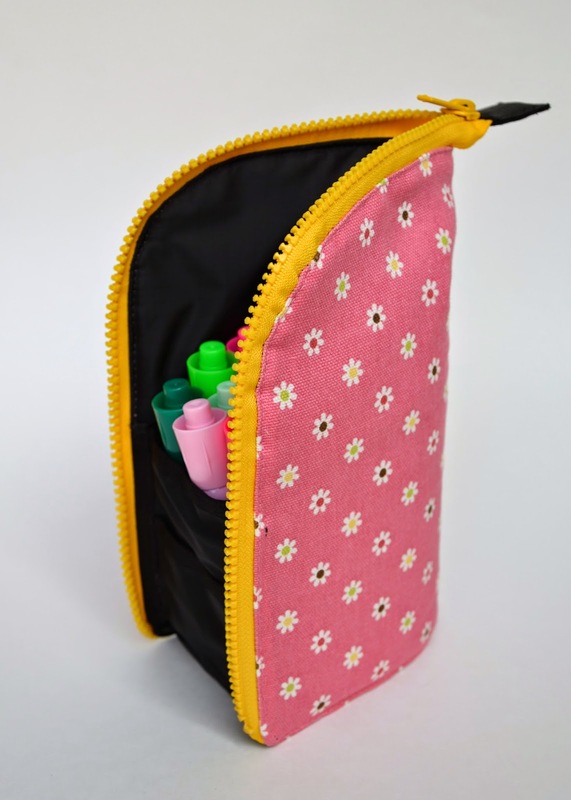 These would also work to hold all my sewing tools next to my machine! 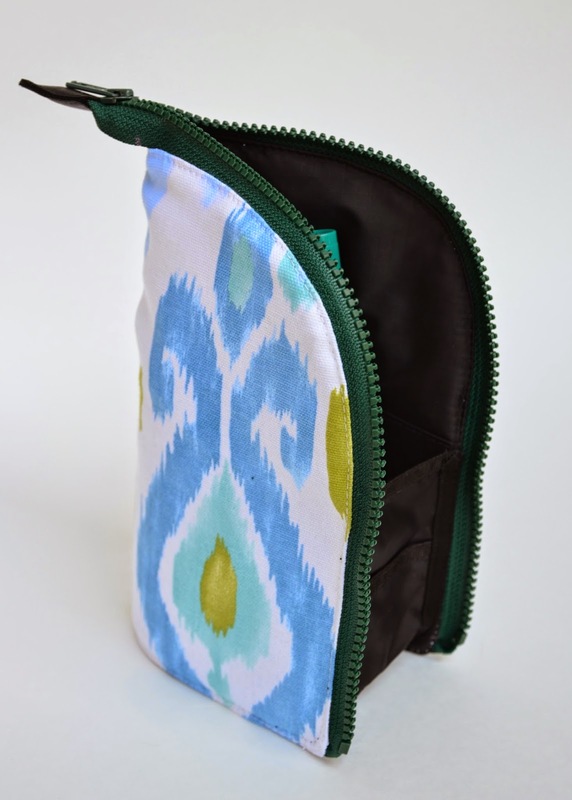 This would be great for traveling toothbrushes, too!! Love it! Thank you so much for sharing the method with us.. It's on my 'to be made list' now. It's fantastic!!!! a great and practical idea!!! thanks for sharing it...I learn a lot with your post, thanks, thanks, thanks for all. Thank you ! This is awesome ! My 6 years old is looking over my shoulder and want one !!! thanks for the tutorial. 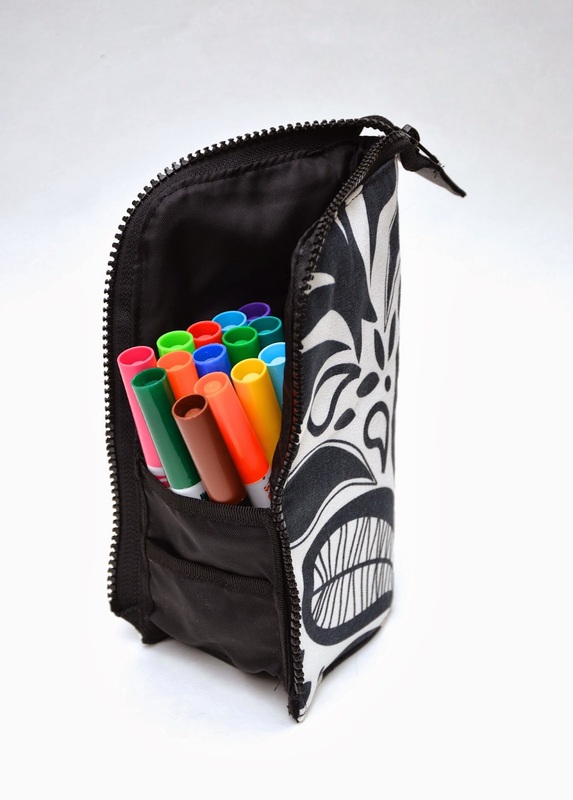 I do, generally, like the roll and find it works well with a flap that folds down to keep the writing utensils inside. Plus, it uses materials I have on hand. 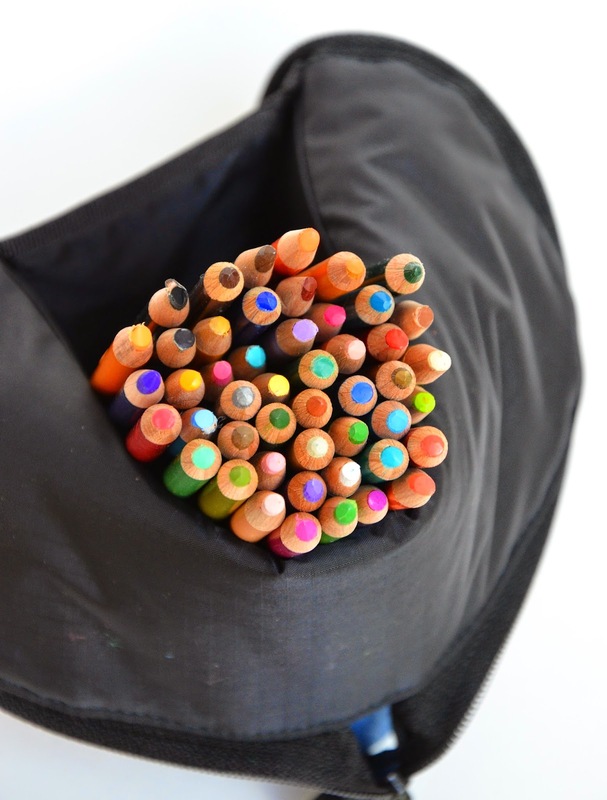 Also, even if the unrolled roll is bumped or dropped, the markers are usually so snug in their pockets that they don't spill - a great boon in a church with a slanted floor! We have a bon voyage party for our girls friends next week (we're moving from London to Singapore in the summer). I'm thinking about making a jumbo batch of these - 30 - as party favours. 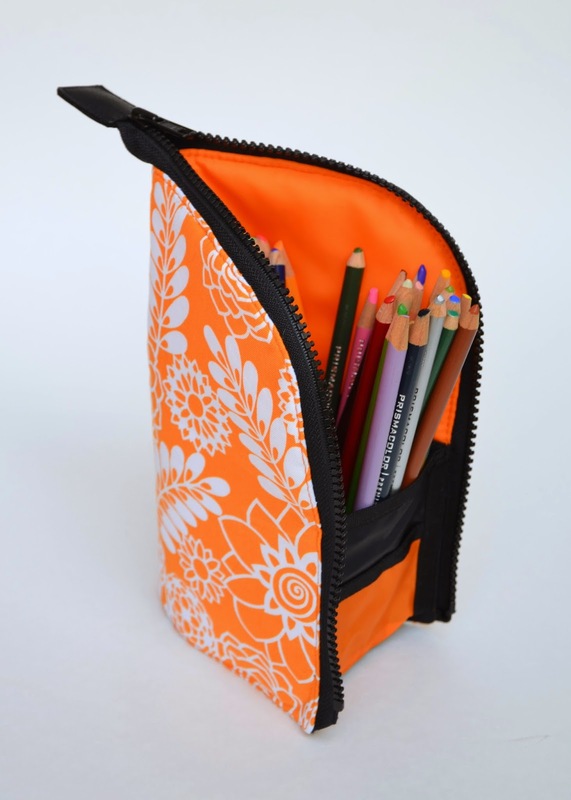 I like the idea of a travelling pencil case, as a farewell gift. I'm hoping that's not a completely crazy idea to make them in a week. The construction looks really straightforward, and I'm hoping that bulk sewing will make the job a bit easier. I'm off to buy supplies today to make a couple of test pouches. I've tried to work out my own template, but it looks a bit different. Can I ask what the rough dimensions of your pieces are? I came up with 9"X8" for the main body, and 3"X6" for the base. I think my base piece is too wide. I'd be incredibly grateful if you had a minute to share your dimensions. As for dimensions - I don't have the template with me (typical; I usually stash it somewhere -often the trash, but I'm sure I didn't this time - once I'm done with the project) but I grabbed one of the girls' finished pouches lying around the house and measured. Main body is 10 x 8 (10 is the width unfolded) and base is 3 wide. Note that these are all sans SA. Don't know the length of the base since it's hard to measure once sewn on. So your dimensions aren't too far off. Good luck! 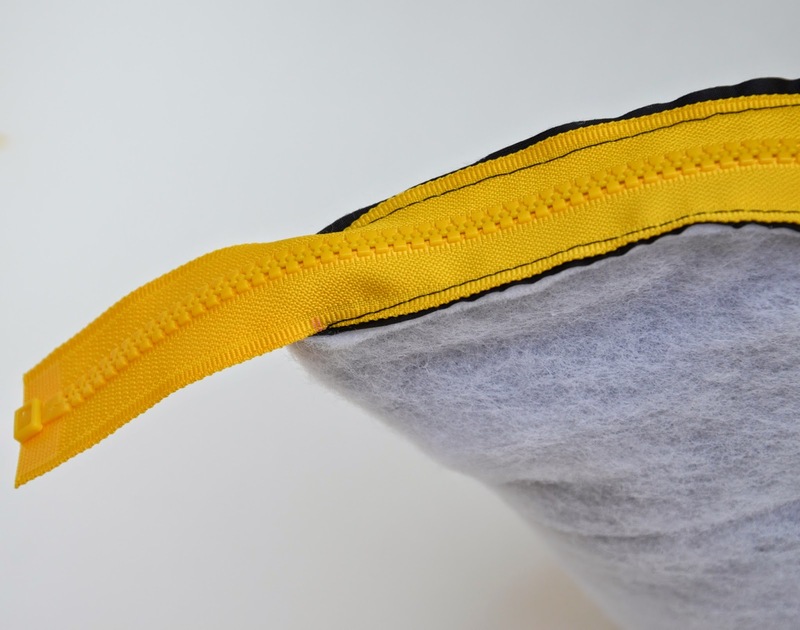 Also try and buy the chunky sport zippers rather than the dainty polyester kind we use in garments. 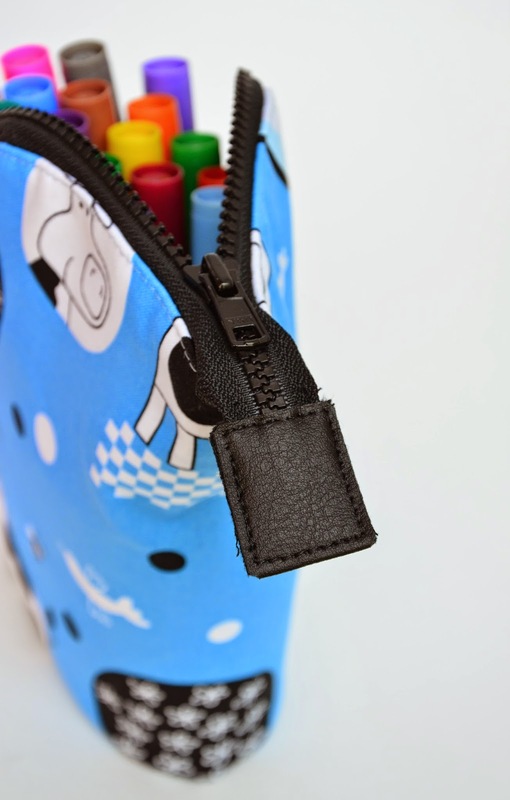 And when you attach the zipper tape to the pouch, do NOT hug the coils the way we do when sewing garments and pencil cases and other kinds of pouches - leave lots of room for the zipper pull to slide up and down on either side of the zipper tape. How thick is the template plastic and how wide is the grosgrain? Thanks so much for the reply. I did a test pouch today, and it was harder than I thought. Clearly I don't have anywhere near as much bag sewing experience as you! I found it so hard to sew that bottom panel in neatly. I have these wobbly, mismatched seam lines. It did work, and the kids love it, but I'm not sure I could manage 30. Perhaps by the end of that, I'd have my method all worked out! yes. totally agree with useless silly crayon/marker/pencil rolls. They look cute and they're fun to sew BUT not all that useful...love the NEW/AFTER version! LiEr, I can't thank you enough for taking the time to reply to my comments with your measurements and tips. 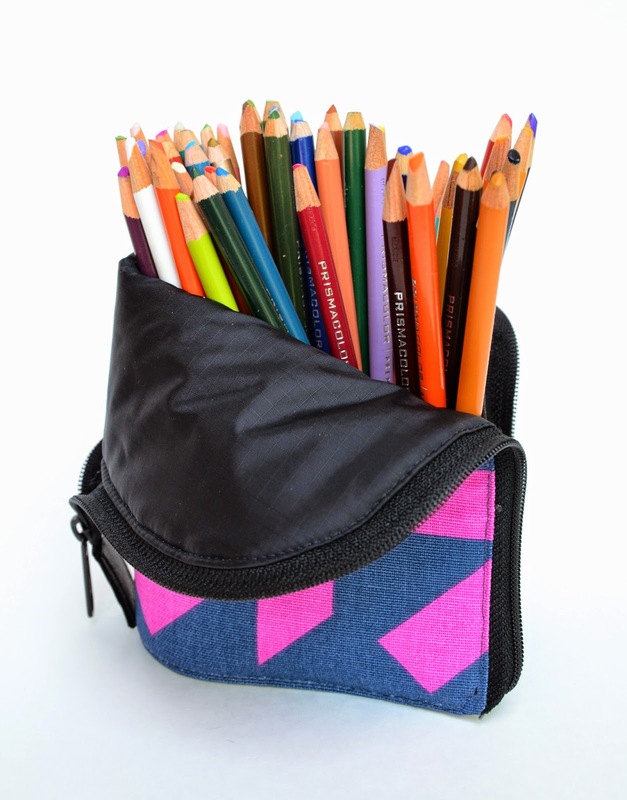 I finished all 28 pencil cases in five days, and handed them out at our farewell party on the weekend. They were a huge hit with all our guests. 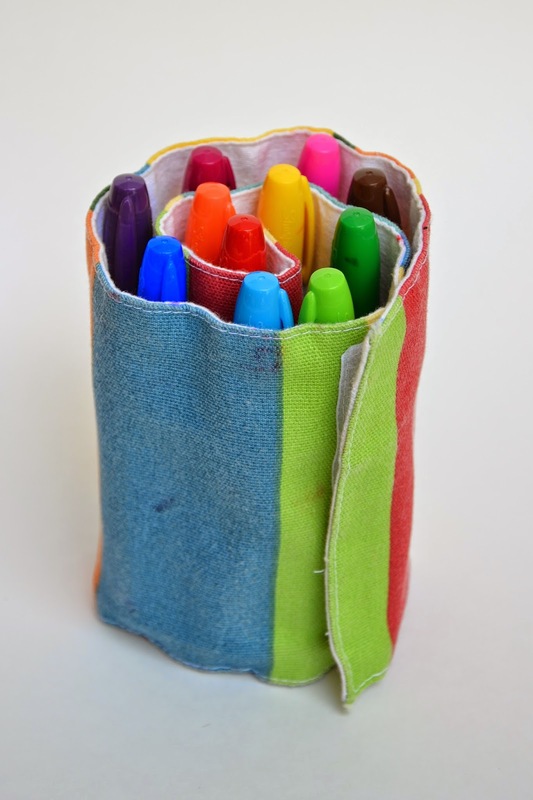 I blogged about making the pencil cases on Random Crafting Adventures. Although it was a huge job, once I got going I slowly figured out ways to make it easier and neater. The pouches made at the end were by far the neatest of all. Thank you so much for your tutorial! I want to make one since I saw your prototype... now with your tutorial and the great blogpost of Katie M I can give it a try... Thanks again and best wishes from Germany! Thank you so much for this tutorial! I made one for my oldest daughter's teacher and I expect to make more as everybody who saws it, wants one! Thanks for this tutorial. I also think the rolls take up too much tabletop and the kids don't really like having to carefully insert each marker every time. This will be trickier to sew, but a lot better to use. Your tutorial is very useful, but have discovered also these youtube videos https://www.youtube.com/watch?v=T_5JU4LViSo and https://www.youtube.com/watch?v=KoQiY277b_0 . Maybe it helps. Link of your webside is among my favorite webs. Thank you. These were great little tutorials. A slightly different method, but a lovely looking end product. really like this item. 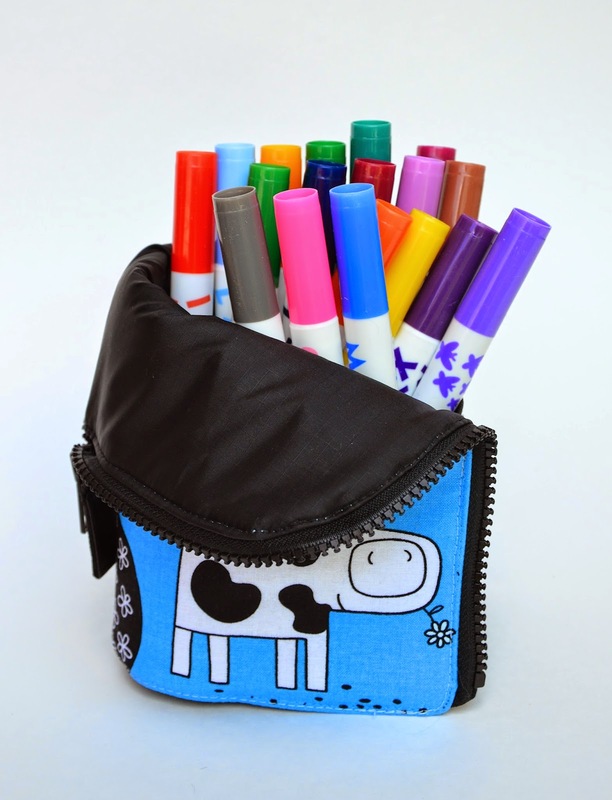 My daughter is into using all kinds of writing implements, and I can see making a bunch of these for her! Thank you for the in-depth tutorial!! WONDERFUL! Love the way it stands up and you can see all the contains, just pick the color you need. 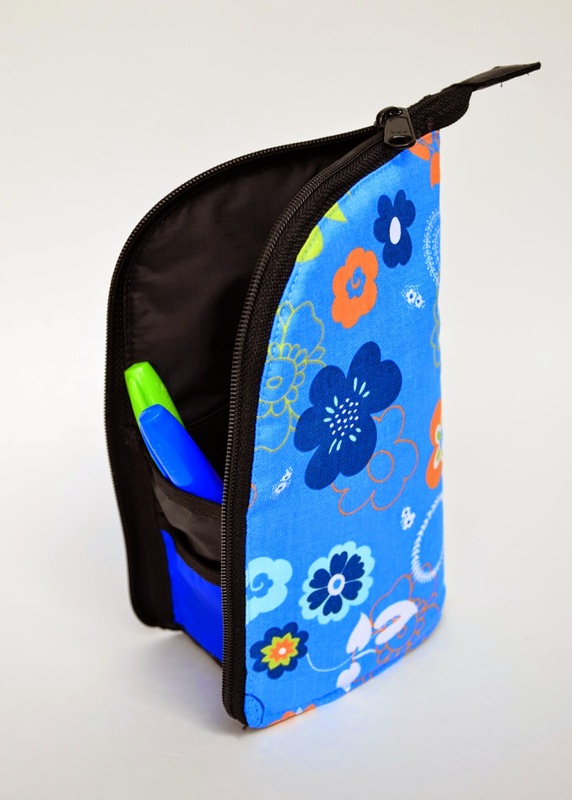 This would be great for a traveling bag, combs, toothbrush etc. See what you need, then zip them up. Wonderful idea & execution! I agree with the no visible sa, serged or not. What a practical product! The challenges of putting it together will be really worth it! Grandchildren's Christmas presents coming up! Hi. Did you sell them ? Thanks..
How thick is the template plastic? Nicole: the template plastic was the regular thickness (the fabric store had both heavy duty and regular). The grosgrain trim was 1/2" I think. These are beautiful!! Any possibilities in providing patterns?? What size of grosgrain did you use? Moro no Brasil, Rio de Janeiro, adorei seu estojo para lápis. Please a template pattern would be so helpful. I tried tonight and I had the most difficult time at them. I think a template would be so helpful. Plus finding the time with a 2 year old and a 1 year old a template would be wonderful. Let me know. I was going to say thank you for this post, but clearly I'm a bit late on that. I read your previous post about the pouches where you explained it and really couldn't visualize how it works. This helps so much (this and the zipper series, especially the explanation of 3D-ness). 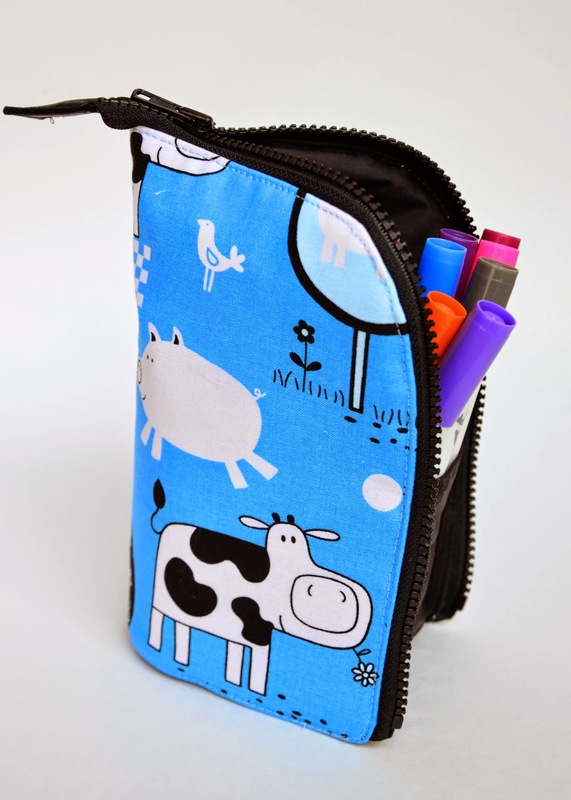 As you make marker pouches for sale, would you consider sharing the template too? Eyeballing that seems like a big question mark for the project, compared with the wonderful hand-holding you provide above on construction! Thank you!! 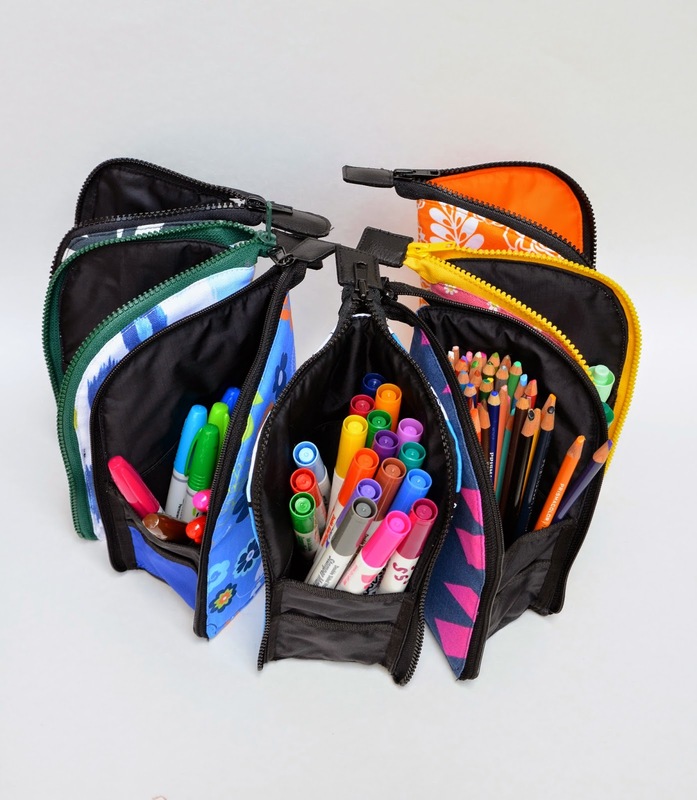 Hello, desherwood00@gmail.com here, and I know I'm late to the party, but these pouches are just what I need for my sewing needs and granddaughters' pencils. Before I get off to the store for supplies, can you tell me what length zippers I should buy? It's quite a trek to a fabric shop here in Oregon, so I need to be prepared with the details. Thanks so much!